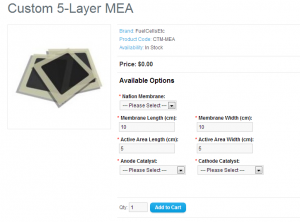 FuelCellsEtc has released an online pricing tool that gives users instant price quotes for custom 5 – Layer or single sided Membrane Electrode Assemblies (MEAs). This marks the first time such a tool has been made available to the fuel cell industry. The tool allows the user to customize sizing, catalyst configuration, and membrane type, with dynamically updated pricing, and the ability to immediately purchase their custom product online. FuelCellsEtc notes that there are no minimum purchases required and the lead time for these custom items are typically one to three business days, with same day shipping available in most cases. The Custom MEA Pricing Calculator can be found at fuelcellsetc.com/custom. FuelCellsEtc has stated that they plan to develop additional online pricing calculators throughout the next year. For more information contact FuelCellsEtc at MEA@FuelCellsEtc.com or call at +1 (979) 635-4706. FuelCellsEtc manufactures and sells high performance custom fuel cell and electrolyzer components to product manufacturers, researchers and educators with industry leading customer service and lead times. FuelCellsEtc’s primary products are Membrane Electrode Assemblies (MEAs), Catalyst Coated Membranes (CCMs), and Gas Diffusion Electrodes (GDEs) for a wide variety of fuel cells and electrolyzers.